Flu season is here. You may have heard about the deadliness of last year's, which caused over 80,000 American deaths, including the deaths of 180 children. According to Darria Long Gillespie, a clinical assistant professor at the University of Tennessee School of Medicine and author of the upcoming book Mom Hacks, while it's impossible to be entirely sure, the 2019 flu season is looking a bit better, but that doesn't mean you should skip your flu shot. And you may want to hurry: The CDC recommends that you should get vaccinated before the end of October. "Last year was really bad. Hopefully, this season won't be as bad, but then again, we don't know for sure," Long Gillespie says, explaining that doctors look to Australia to make predictions, as their flu season happens first. Last year's killer strain was H3N2, which Long Gillespie says we can expect to see some form of again this year. When does flu season start, and how long does it last? Flu season spans from October through May every year. According to the Centers for Disease Control and Prevention (CDC), older people, young children, pregnant women, and people with long-term health conditions are at greater risk for flu complications. Anyone can be affected, though, including those who got a flu shot. So how dangerous is this flu season, really? Here's what you need to know about the symptoms, risks, and tips that can help you stay healthy. How dangerous is the flu in 2019? While the flu is common - the CDC estimates that millions of people get it every year - it's still something you should take seriously. It can land you in the hospital and even kill you. Yes, older people and young children are more likely to experience severe cases, but it's not unheard of for a generally healthy 20-something to die from the flu, as the tragic case of a 21-year-old late last year shows. This is because the flu can lead to deadly complications, including pneumonia and sepsis. That said, you can't know for sure that you have the flu unless you take a laboratory test. Won't the flu shot prevent me from getting it? Each year, researchers formulate a flu vaccine meant to protect against the three or four flu virus strains they think will be the most common during the upcoming season. But getting the vaccine doesn't guarantee you won't get the flu. After researchers identify the strains likely to cause the most trouble each year, viruses can mutate, meaning strains that researchers didn't anticipate can become prevalent. This means that "making a vaccine for the flu is a constant moving target; it is difficult to make a vaccine that is a perfect match," Long Gillespie says. Before you ask, yes, you should still get a flu shot. "Remember, the vaccine does two things: prevents you from getting the flu in the first place, and if you get it, reduces the severity," Long Gillespie says. You'll want all the help you can get in fighting the flu. Getting the vaccine is a smart step. A major difference between the 2017 to 2018 flu season and the 2018 to 2019 flu season is that this year a vaccine nasal spray is available in addition to the flu shot. The spray is safe for anyone between the ages of two and 49 who is not pregnant, although you should speak with your doctor to learn which vaccine is best for you. Long Gillespie says that the shot is still most effective, but the spray is certainly better than nothing. What else can I do to avoid the flu this year? Even if you're not pregnant, elderly, an infant, or dealing with chronic illness, it's important to reduce your risk. Getting proper sleep, adequate nutrition, and regular exercise can all help keep your immune system strong. Long Gillespie says that healthy habits like these have been shown to ward off respiratory viruses like the flu. You should also be hand-washing religiously (and don't shy away from the Purell). "This is the season where you can be a complete germophobe and it's entirely fine," says Long Gillespie. "Wash your hands frequently, carry hand sanitizer, and either wash or sanitize after touching shared surfaces [and] before you eat or touch your face." An analysis in the BMJ last year, meanwhile, suggests that taking vitamin D can lower your risk of developing a respiratory infection, including the flu. Looking at data from 25 studies and over 10,000 participants, researchers observed that vitamin D supplements appeared to lower infection risk by about 10 percent in people who weren't deficient in the vitamin and by about 50 percent in people who were. To learn whether you could benefit from more vitamin D, check out our guide to the sunshine vitamin. If I get the flu, how long will it last and what are my treatment options? "The mass majority of people who get the flu will feel miserable, but you will likely get better on your own," Long Gillespie says. If you feel like crap, don't try to push through it by going to work or yoga - rest and hydration are your new best friends until you're feeling better. Even if you feel horrible, use it as an excuse to catch up on your favorite TV show, do not push yourself while you have the flu, going into work will only make you worse and spread the virus to others. There are prescription antiviral drugs that can help treat the flu, but doctors usually don't prescribe them for flu-afflicted but otherwise healthy adults. While these drugs can shorten the time you're sick, it's usually only by a day or a half a day, Long Gillespie says. "You do need to take them within 48 hours of your symptoms starting, the sooner you take them the sooner is the better," she says. As with any drug, there are potential side effects to antivirals, including nausea and vomiting. If you have flu symptoms and "you have a chronic condition such as asthma, diabetes, or autoimmune conditions (among many other chronic conditions), you may be a candidate" for an antiviral drug, Long Gillespie says, so check with your doctor. You should also see a doctor if you experience confusion, shortness of breath, excessive lethargy, or a fever that hits 103 degrees or higher or doesn't go away within a couple of days. 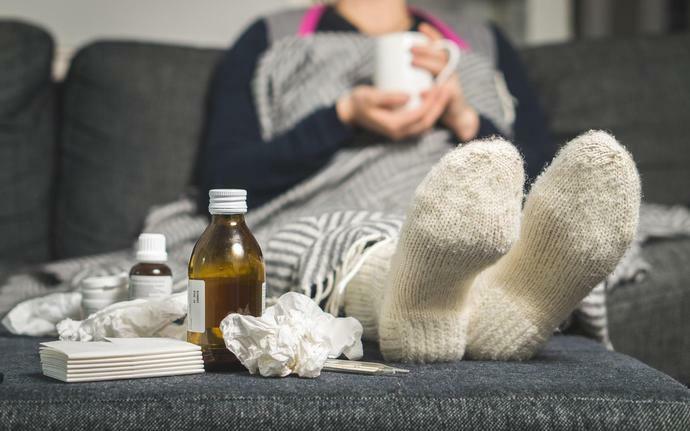 While most people who catch the flu recover on their own, Long Gillespie explains that on top of the flu, while their immune system is down, some people catch a secondary bacterial infection, which requires antibiotics and a trip to the doctor. When in doubt, seek medical attention so your condition doesn't spiral. What's the deal with adenoviruses? It's worth noting that there's another group of pathogens causing flu-like misery again this season: adenoviruses, which the CDC warns can lead to anything from a cold or a sore throat to bronchitis, pneumonia, diarrhea, pink eye, and fever. Experts aren't sure exactly how prevalent adenoviruses are, but the World Health Organization estimates that they cause two to five percent of all respiratory infections around the world. Currently, there's no adenovirus vaccine currently available to civilians, although a Philadelphia-based start-up is working on creating one. Until then, you can use many of the same tactics to avoid getting an adenoviral infection as you use to avoid the flu: Follow healthy habits, wash your hands regularly, and avoid touching your face with unwashed hands. And, for the last time: Stay home and rest up.